Building NEW Neuropathways to Master Visual and Auditory Memory, Visual Perceptual Skills, Visual Motor Skill Development and More! 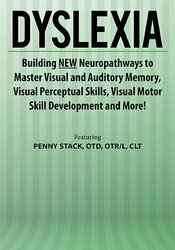 Dyslexia - the invisible disability that impacts 1:5 individuals! It's not just an issue of trying harder or paying attention. You know the stories you hear from your clients - hours of studying just to forget it all on a test the following day, constant lack of ability to understand what they read, difficulty remembering lists or instructions beyond three, the overwhelming frustration of knowing what they want to say or do, but not being able to express it on paper or get the words out, socially withdrawn in attempt to hide their struggles. Articulate the 3 types of dyslexia and treatment strategies for each specific type such as chunking for recital, chunking, and association for visual and auditory memory. Assess the executive cognitive functions that impact processing speed and reading comprehension. Communicate treatment strategies to address visual perceptual, visual motor integration, auditory and visual memory deficits. Present two ICD-10 treatment diagnostic codes and CPT billing codes to properly bill for reimbursement of provided services. Assess 3 strategies to improve ability to recall multi-step instructions and letter sequence for spelling.